How Do I Add a Deduction to a Profile? When you are creating a profile you have the option to add voluntary deductions to be associated with the profile. 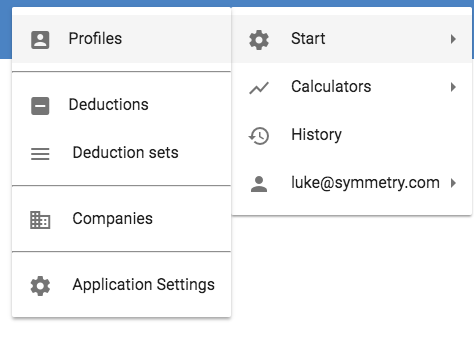 This means when you run a calculation, you can select the profile you need, and the deduction set will automatically populate in the calculator. Start by navigating to the "Profiles" page. Whether you are creating a new profile or editing an already existing one, you have the option to add voluntary deductions. Select a profile you wish to edit or click on the plus icon to create a new profile. Following the state information section, you have "Voluntary Deductions." This is where you can add a deduction set to the profile. In order to create deductions and build a deduction set, we suggest reading through this brief article: How do I create a deduction set and add custom deductions to it? If you have already built a deduction set, select the one you want to be associated with this profile. If you haven't built a deduction set, you can build one by selecting "Add a deduction set." Once you have created deductions and added them to a deduction set, you will be able to select voluntary deductions for a profile. Now, when you select a profile to run a calculation, the appropriate deduction set will be automatically populated in the calculator.